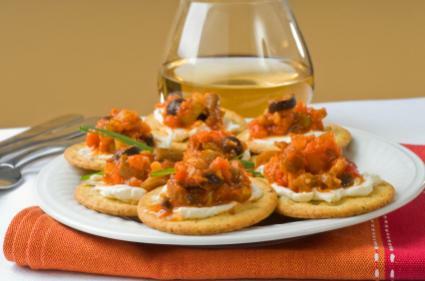 Don't stress out at your next big event, serve simple party foods to save yourself time and energy. By keeping it simple, you can enjoy the party and not worry about extra hassles. There are numerous ideas for simple party foods. Whether you are planning a birthday party, housewarming or an intimate get-together, offering a simple menu can be both time-saving and stress free for the host or hostess. Who wants to be in the kitchen all day long when you could be out mingling with your guests? Keep the food simple to make the day easy for all involved. Another option to consider is having a dessert only menu. Serve a variety of desserts such as cookies, an assortment of cakes and brownies. You could also offer a healthy option such as fresh fruit for those not wanting to indulge! If you are going with a party theme, then have your simple foods fit into the theme. For example, for a luau you could serve simple food items such as grilled pineapple, vegetable kabobs and satay. For a child's birthday party, serve simple foods that kids will like and you won't have to spend much time creating. Items like pizza, cupcakes and a variety of snacks are always a big hit with children. If cooking is not on your agenda, then you could always visit your local market and pick up a few pre-made items. Sandwich rings, deli trays and pre-made salads are all great options. Add some snacks such as chips and pretzels and you are ready to go.If you live close to a warehouse club, there are a variety of frozen items to choose from that only need to be heated and are ready to serve. Complete your simple party foods menu by offering a variety of drink choices. Instead of standing around mixing up individual cocktails, whip up a pitcher of margaritas or make fresh lemonade. Keeping the drinks simple will also save you time and energy. There are also easy punch recipes that can be made in advance and served either with or without alcohol. You could also serve several different wines and have your guests pick their favorites. Always offer both red and white wines. Keep it simple and not only will your guests enjoy themselves but you will as well.